To go off my last post, there’s another book I was swept away by, but I’m giving it a post of its own. This may be because I adore the author and watched the book grow from sent-to-editor to publication. Yes, I’m being totally biased in my push for people to buy/borrow/just plain read this but, but at least I’m being honest about it, right? 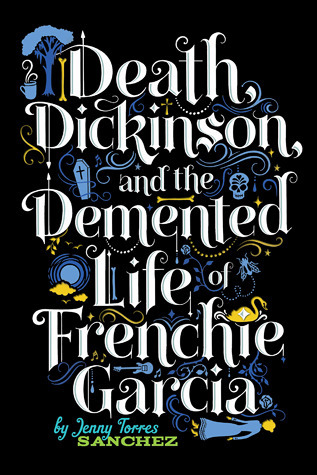 Happy book birthday to Jenny Torres Sanchez’s DEATH, DICKINSON, AND THE DEMENTED LIFE OF FRENCHIE GARCIA!!!! It is the summer after Frenchie Garcia’s senior year, and she can’t come to grips with the death of Andy Cooper. Her friends don’t know that she had a secret crush on her classmate, and they especially don’t know that she was with Andy right before he committed suicide. The only person who does know is Frenchie’s imaginary pal Em (a.k.a. Emily Dickinson), who she hangs out with at the cemetery down the street. When Frenchie’s guilt and confusion come to a head, she decides there is only one way to truly figure out why Andy chose to be with her during his last hours. To mimic Stefan for a second, this book’s got everything. A night of craziness. Graveyard secrets. Poetry. Swan boat theft. Seriously, it’s a wonderful, wonderful book about a girl coming to grip with the fact that some people have more going on than what’s shown, some people have secrets no one knows, and sometimes no matter what you do, you cannot reach them. It’s about realizing some situations aren’t always black and white. That not every event has a perfect solution. And that sometimes you just need to accept the unknown. Frenchie is one of those real characters that sticks with you. She’s not perfect, but she knows it. And I think readers will remember her for quite some time. Go read, and let me know what you think.